Are you seeing small flies hovering around your drains or stagnated water? Good chances are these pesky insects are drain flies. Drain flies are also known as moth flies, sewer gnats, moth flies and come from the family of Psychodidae. Sometimes the drain fly can be confused as the fruit fly as they closely resemble each other. Unfortunately drain flies breed at a rapid rate and their populations can grow quite quickly. For every female Drain flies she can lay up to 200 eggs per day, so an infestation of the Drain fly can get out of hand very quickly if there is a water source for it to survive in. Identifying drain flies in your home! What do drain flies look like and how you can identify them. Drain flies body & wings are covered with very thin long hair that make it look moth like. 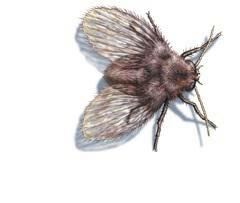 Drain flies have a black to dark grey coloured body with lighter-coloured wings. Drain flies are poor flyers and will usually only have short flights. Drain flies are easily identifde as it makes short hopping flights. Drain flies are generally found near the main water sources. Where are drain flies typically found in your home? Drain flies will often feed on decaying organic matter in stagnate water, moss and flower nectar. Drain flies are very adaptable and will live and breed in various types of environments. Inspect all areas of your kitchen and find the source which is attracting fruit flies. Remove all sources in a plastic bag, tie it up and dispose the bag in the council bin. All fresh produce place inside the fridge until the fruit flies have ceased. Frequently clean your bins and make sure that it is not damp. Place either bleach or draino down your sink and drains, cover with a plug, do this at the end of each night before bed for three nights as this will get rid of any fruit flies and their eggs in your sink or drain. You can make a homemade remedy by grabbing a jar, putting a cone shape funnel in it with a piece of fruit, honey or vinegar inside. The fruit flies can fly in but is unable to fly back out. Natural way of getting rid of a light infestation of fleas.